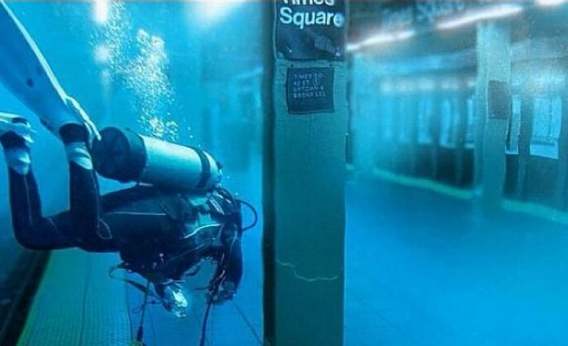 False Hurricane Sandy rumors: Police scanner fools Twitter into spreading misinformation. No, this is not what New York’s Times Square subway station looked like last night. If you were getting your news about Hurricane Sandy from Twitter last night, you might have thought that New York had been hit by the Mayan apocalypse rather than simply a very large storm. Some of the surreal and disturbing reports being circulated on the site were genuine: A hospital did lose power, a power transformer did explode, the East Village really was partially submerged, and water was pouring into the subways. (See The Slatest for YouTube evidence.) Many others, however, were apocryphal. The New York Stock Exchange did not flood. The MTA did not announce that all subways would be closed all week. The storm did not look like this, this, or this. The city’s 911 lines did not become so jammed that officials began asking people to report emergencies via Twitter instead. And no hospitals burned while firefighters stood helplessly by, marooned by flooding. So where did these rumors come from? It’s possible that some were deliberate hoaxes. But I decided to take a closer look at one of the most disturbing and widely disseminated bits of misinformation—the report of a fire at the Coney Island Hospital—and found that it originated not as a prank, but as a report on a police scanner. Typically the province of local news reporters and hobbyists, the scanner became a widely relied-upon resource last night thanks to an online audio player that allowed people to tune in even if they didn’t have an actual radio. From there, it was spread far and wide by Twitter users who apparently viewed the scanner as a solid primary source. But as any local news reporter knows, the scanner is not a solid primary source. It’s a forum through which police and firefighters communicate and trade tips with dispatchers, sifting through information that often comes second- or third-hand, through residents’$2 911 calls and witnesses in the field. As these tips come in, officials are sent out to investigate them. Only once they’re on scene can they begin to determine whether the reports are true. And in fact, that’s exactly what happened with the hospital fire. Thankfully, as much as Twitter can be a font of falsehoods, it is typically almost as quick to home in on the truth. In this case, it was a local news blog, Sheepshead Bites, that sussed out what appeared to be the origin of the Coney Island rumors (though it’s worth noting that this report, too, was third-hand). Its debunking quickly made the rounds.